It's Not Friendsgiving Without the Turducken! Just in time for the Thanksgiving season, I was fortunate to receive an original turducken, aka "The Ultimate Family Feast"! For the non-turducken-educated, the turducken is a giant, meaty beast. De-boned duck and chicken breasts are wrapped up with stuffing into a whole turkey which is also de-boned except for wings and drumsticks. The kind folks at Echelon Foods, makers of the original turducken, sent me one of the triple bird specialty the week before Thanksgiving. Since this bad boy feeds 12-15 adults, I thought it would be perfect to bring to my Friendsgiving the Saturday after Turkey Day. Now, I have to say, I was a little intimidated at the thought of making a turducken. I've never made a turkey or whole chicken, let alone three birds in one. Luckily, the turducken came with handy directions and was already pre-seasoned. The big bird arrived frozen so I had to defrost it for 4 days before cooking it. You have the option to thaw in a bucket of water but I let mine hang out in the fridge. Once it was fully thawed, I took it out of its plastic wrap and placed it in an aluminum roasting pan. Easy as can be. 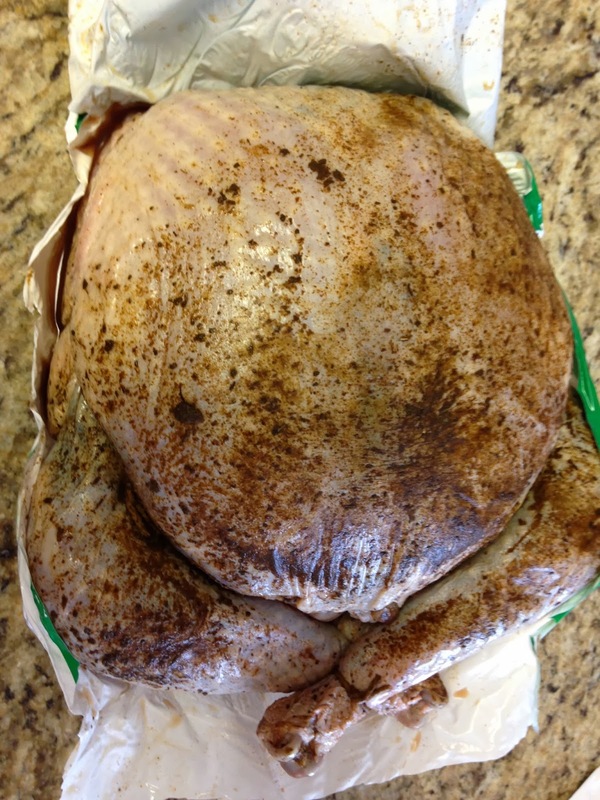 To cook the turducken, it's recommended that you roast it at a low temperature. I baked mine at 220 F and after a few hours, the internal temperature was nowhere near where it should have been. I decided to cover it with foil to prevent the birds from browning even more than they had been, and then I cranked up the oven to 350 F.
After dialing up the heat, I ended up slathering some butter on the outside to ensure the turkey breasts wouldn't dry out. To keep it nice and moist, I also basted the turducken every 30 minutes for the last two hours of cooking. The best indicator that the bird is done is to check the internal temperature and ensure it exceeds 165 F. Mine still wasn't there yet so I cranked up the heat to 400 F for the last hour. That finally did the trick and the total cooking time ended up being 5.5 hours. 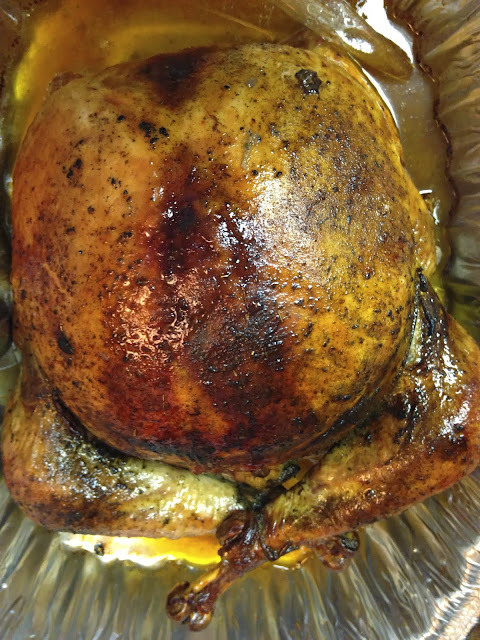 After taking the big birds out of the oven, my friend Loren injected it with some of the pan drippings (read: butter). There was no way that thing was going to be dry! The fattyness of the duck also kept things nice and juicy. Since my friend Shelby was hosting Friendsgiving at her place, I decided it was best to wrap up the turducken and cut it up at her place. 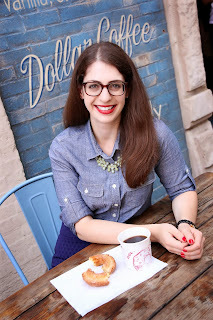 After presenting it on a platter for all to see, Loren started chopping away. I was so glad he knew how to slice and dice that thing because I certainly didn't! Loren started by removing the only bones which were the turkey wings and legs. Next, he sliced open the breasts and that's when we got to see the awesome cross section of meats! It was mostly turkey breast, with a good amount of stuffing and duck and a small sliver of chicken. Lastly, he sliced the breasts up lengthwise so that every slice included all three meats. After all was done, we had a beautiful meat masterpiece! The turducken provided a nice protein base to complement the amazing dishes that were brought to the Friendsgiving celebration. 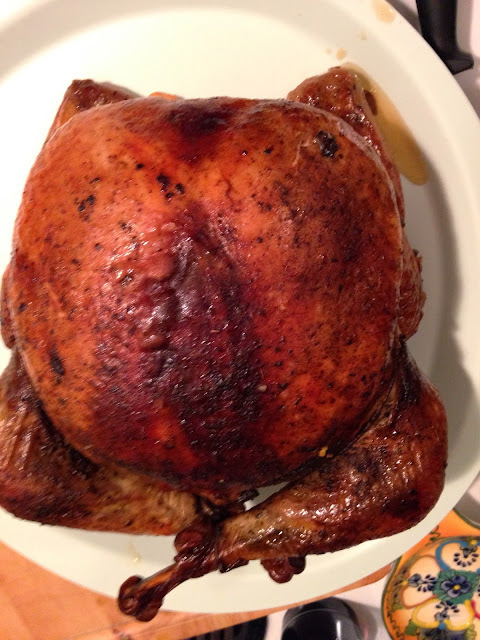 Loren also barbecued a second turkey which had an intense, smoky flavor. From green bean casserole and mashed potatoes, to roasted veggies and latkes for Hanukkah, we had quite the spread. Overall, Friendsgiving was a success and the turducken was quite a hit! The turducken itself was not difficult to prepare, it's just a little high maintenance toward the end when you have to baste it and make sure it's cooking evenly and fully. 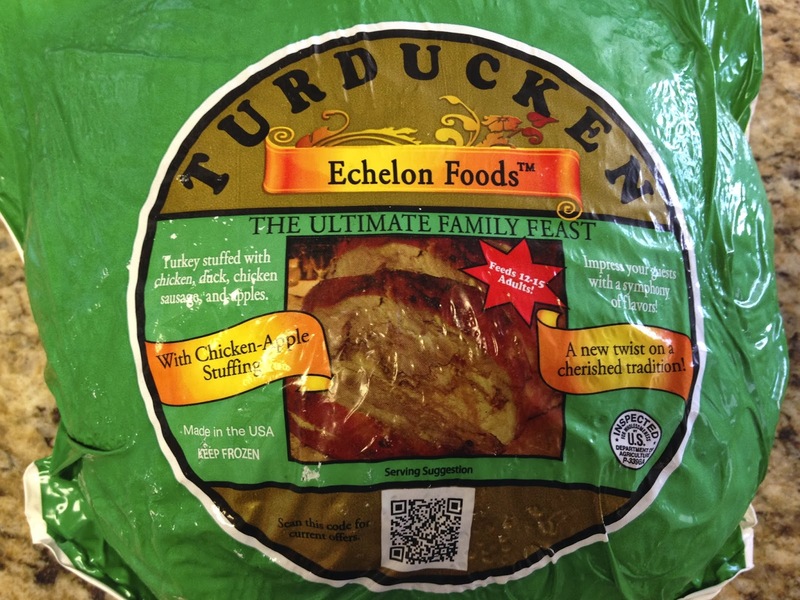 Head over to Echelon Foods' site to learn more about the turducken and order yours for your next gluttonous gathering! 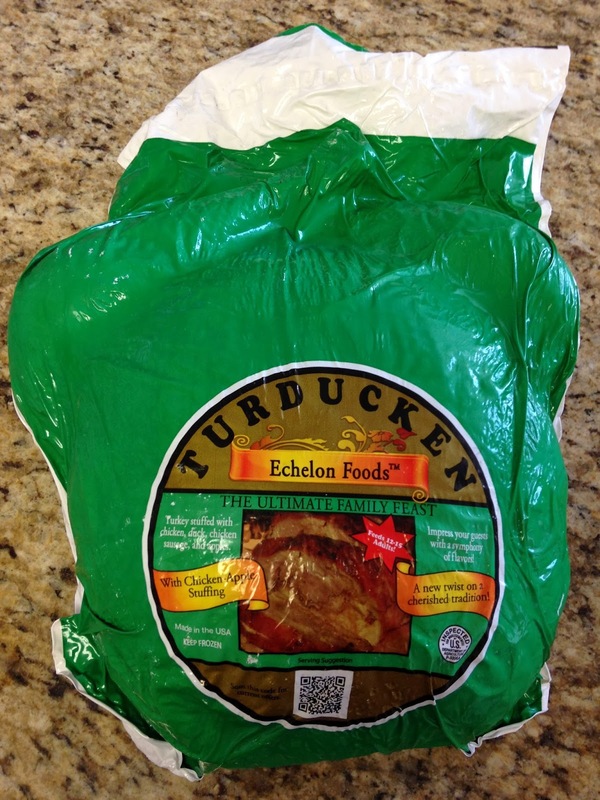 Have you ever cooked a turducken? If so, how'd it turn out? If not, would you consider making one? Note: Echelon Foods provided the turducken free of charge, however, the thoughts and opinions expressed herein are my own.